Warrior of Plasm #1 - Defiant Comics - Metamorphosis - August 1993. Warriors of Plasm - 1993 - Defiant Comics- Great Series 1 M/NM! 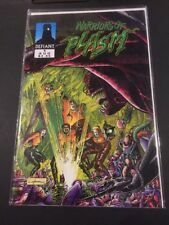 WARRIORS OF PLASM #1 FIRST APPEARANCE DEFIANT 1993 NICE!!! This page was last updated: 21-Apr 13:45. Number of bids and bid amounts may be slightly out of date. See each listing for international shipping options and costs.